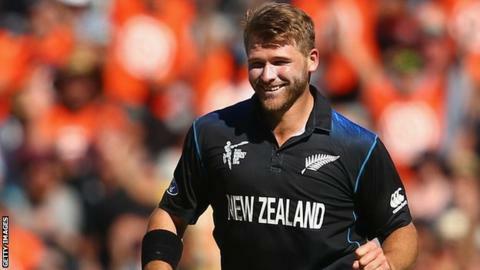 Somerset have signed New Zealand all-rounder Corey Anderson for the second half of this summer's T20 Blast. The 24-year-old has played for the Kiwis in all three formats of the game, including 15 T20 internationals. His first game for Somerset will be against Middlesex at Uxbridge on 26 June, three days after New Zealand's tour to England comes to an end. "I have always wanted to play domestic cricket in England so I am very pleased," he told the club website. "I look forward to linking up with Somerset later in the season and continuing the strong link that there has always been between the club and players from New Zealand." Corey Anderson made 131 not out off 47 balls in a one-day international against the West Indies in Queenstown last year. He reached three figures off 36 balls, which stood as the fastest one-day century until South Africa's AB de Villiers struck a 31-ball hundred against West Indies last month. Somerset won the domestic T20 competition in 2005, and have reached finals day on four other occasions, but last summer finished fifth in the South division, and missed out on a place in the knockout phase. Director of cricket Matt Maynard said: "I am absolutely delighted that Corey is able to join us straight after the New Zealand tour to England concludes. "He is a very talented all-rounder and strikes the ball well coming in lower in the order, which is vital in T20 cricket. "Sohail Tanvir will play the first half of the T20 competition and Corey will be playing with us from game eight through to game 14, after which he goes off with New Zealand on another tour."